I am still waking up 3-4 times per night to nurse, resulting in little sleep; what little I get is interrupted and anything but restful. because of the broken sleep, exhaustion is the norm; exhaustion does not produce optimal work output. my work clothes still don’t fit; I gained 50 pounds during my pregnancy, and still have 20 (give or take) more to lose. my baby continues to change on a daily basis; he just started being alert more during the day than asleep, meaning I get to spend more time bonding and getting to know him. If forced to do so, I know I would struggle on a deep emotional level to put him in someone else’s care right now. My heart goes out to mamas who have had to do this earlier than I will have to. my back is jacked. up. Sometime around 3 weeks postpartum, I sat down funny and jammed my sacroiliac joint. The pain continues to be unpredictable and fierce. Although my partner may disagree, I feel like I’ve gotten pretty good at grinning and bearing it. 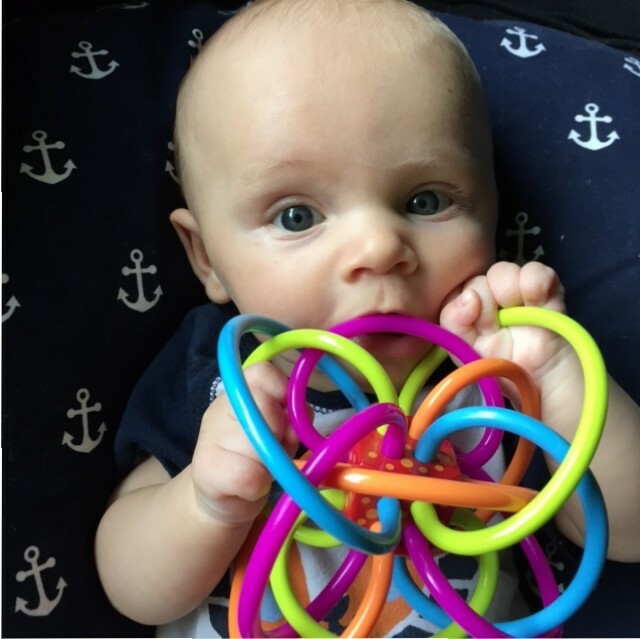 I don’t want to miss any of the good parts of these first few months of my son’s life. So despite the pain, we’ve gone on walks. And to a local public pool. And had visits with grandmas and grandpa. But I’d be lying if I didn’t say that sitting in any one position for longer thirty minutes or so (like at my computer) is difficult. And given that I used all my sick days for my maternity leave, I wouldn’t have any sick days to use if I had to take any because of my back. What a catch 22.
this past week, my thumbs, wrists, and forearms started aching. It’s apparently a thing called mommy thumb. It’s painful and puts typing in the category of repetitive movements I should avoid doing too much of. For this reasons, too, returning to work at this point would mean I’d have to cut corners and would perform at a far-below-normal level. I share this list not to complain (though I realize I might sound a little whiny), but rather to bring into light the physical challenges that follow in the aftermath of giving birth — even almost three months later. I’ve had lower back pain before, but never like this. And healing isn’t being helped by my diastasis recti, or splitting of the abdominal wall. Mine is slight in the whole scope of what can happen during pregnancy and birth, but it’s making the project of strengthening my core muscles (which will in turn strengthen my back and help alleviate some of the pain) more challenging than it would normally be. I’ve tried working on scholarship (since publishing articles is a major part of how I get to keep my job in the long-term), but now realize why people stop the tenure clock. Hopefully I’ll get some work days in soon. Not sure how that’ll happen, but I remain optimistic that it will. And to the readers who have commented both publicly and privately that people choose to have children aren’t forced into it, or having children is selfish, or as one reader put it, “If you ‘want’ that child, then you better be prepared to handle that ‘want’ without complaining that people owe you something financially for that choice,” I say: mmmkay. First of all, I never thought I couldn’t handle the want to have a child. And I’m not arguing that I should be given something special and out of the ordinary for my choice. All I’m saying is that workers should be taken care of, and women deal with postpartum issues in relative silence and isolation, sucking up the pain and hardship that follows whether they had a complicated pregnancy and/or birth. And, given that we live in a patriarchal society where women are not treated the same as their male counterparts, I think it bears repeating that having a baby requires more time off from work than most people in this country are given. Time off is not some sort of gift — I’m learning first-hand right now just how difficult being responsible for childcare really is. I babysat as a kid, but that was nothing in comparison — caring for a baby full-time is exhausting, emotional, physically challenging work. And I can imagine that if men were the ones bearing the babies, the situation would be a whole lot different. But despite all the back and wrist pain, sleepless nights, and overwhelm, there’s this. And it’s pretty darn great. Thank you for raising important points and questions about becoming a mother. And I agree women deal with so much of the postpartum life in silence. It can be so isolating. So true. Thank goodness for Waddle n Swaddle groups and classes — I’d’ve been lost without you and the amazing folks I’ve met through the shop! Such good points! And ugh. None of it seems to take care of people, really.